Okay, I've been lazy-posting...sorry, holiday stuff and all that. Expect more of the same on Sunday. But during a slow point at the store on Friday, Employee Aaron was poking through the latest issue of Star Wars Insider , and pointed out the article on bootleg items within. Okay, the "LORD VADER" belt buckle was 100% fantastic, but what grabbed my eye was the sidebar on Star Wars fanzines. Yeah, the author of the article does note that fanzines don't really qualify as "bootlegs," but they are unofficial SW products, and hence their inclusion. "SPORTS NIGHT+QUANTUM LEAP+BUFFY+STAR WARS-Gen Fanzine"
"The title of this multi-media fanzine is FOR THOSE WHO WAIT, was published in 2001 and is 164 pages long. It is a digest-sized fanzine and is both and gen and slash zine. If male/male or heterosexual relationship offends you, please do not bid. This is based on the events of September 11, 2001; these stories were written at various times in the hours, days and weeks following the tragedies, based upon information available at the time. Some stories contain facts and numbers which were later changed or modified." Oh, man, my brain is still trying to deal with this. Have yourself a merry little End of Civilization. So this statue and the New Avengers Spider-Man bust (discussed previously) are in a race to see who reaches obsolescence first. 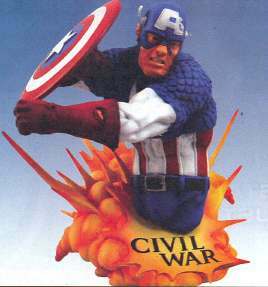 Well, I suppose you could putty and paint over the engraved "Civil War" lettering on the statue once the series is long forgotten, and voilà, you'll be left with a swank "Captain America 'Exploding Crotch'" statue. 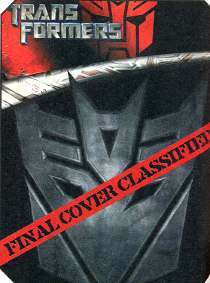 Hmmm...I'm guessing it's going to be a picture of a giant robot or two that I don't recognize since I don't know a darned thing about the Transformers. Boy, am I so not the target audience for this. Make fun of me if you must, but I think I need this shirt. We're all nerds about something. 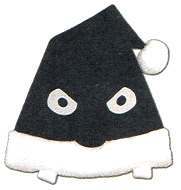 I've been trying to think of something to say about this item, and all I can come up with is "Santa's angry possessed hat wants to have some words with you." Yeah, I know, but that's all I got. 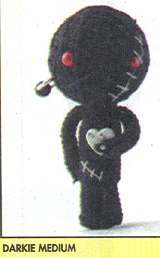 It's the most huggable, lovable grub ever! Well, as you may have seen on the internet here and there, the "Modern" tag may no longer apply to this statue. "The 9" scale Marshall Full-Stack Amp sculptures are officially licensed with Marshall Amplification, LLC. The Marshall Full-Stack Amp (JCM 800 Series) is a limited edition, hand-numbered, and hand-painted sculpture. The figure will be cast in a poly-resin and hand-painted in fine detail. Each sculpture in the Guitar Hero series is hand-numbered and displayed on an attractive wooden base. Okay, I know these are designed to go along with the rock musician statues from the same manufacturer, but it's still a STATUE OF A STACK OF AMPS. 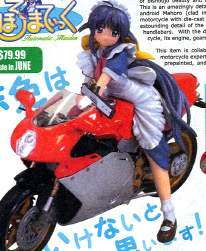 It's a maid...strike that, an android maid with a gun on a motorcycle. I don't know why, or how, and I'm not lookin' for an explanation...just let me enjoy it for what it is: fantastic. 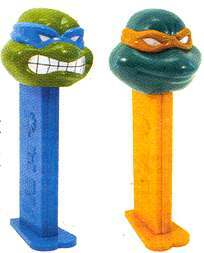 "Let Leonardo and Michelangelo fill your mouth cavity with some tempting Pez candy!" "Hey, what's this sword from?" "It's a replica of a sword from that one fantasy film...um, the one with the dragons...."
" Lord of the Rings ?" 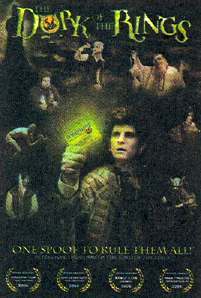 "Um, no, that's not it...."
" Reign of Fire ?" "No, I don't think so...."
" Chronicles of Narnia ?" "I don't think there were any dragons in that movie...."
"...This 100-minute irreverent epic parody will keep you in stitches as you watch the throbbit Frudo Buggins, Arogant the Wrangler, Gladwrapriel, Randolf the Wizard, Gimpi the Dweeb, Legoblocks the Elfis and many more buffoons as they journey through Muddle-earth." 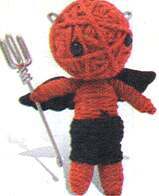 Hell is something like this. "But you must admit it's different!" This is one of my favorite splash pages, taken from Superman #230 (October 1970), drawn by Curt Swan and Dan Adkins. I particularly enjoy how the characters themselves explain the conceit of the "imaginary tale" that occupies this issue (and the next one, in fact). 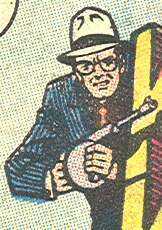 Plus, it's hard to beat a fantastic title like "Killer Kent Versus Super Luthor" -- that's high concept all over. As Superman said, a comic magazine is indeed a wonderful thing. ...because the part of my brain that generates weblog content is otherwise committed to "what the heck am I going to buy for my friends and family for Christmas this year," which I'm sure none of you can relate to. I'm also trying to slap together one of those year-end posts, best-ofs and worst-ofs and what have you, but that's probably going to have to wait until after Christmas, when the pressure's off. Um...how did the Thing pick up that pile of men? Dan Dare via Sin City. Bully is telling a serialized Christmas story, which reminds me of the days of my long-departed youth, when I would look forward to the special Christmas serials that would run in our local paper. Remember when newspapers actively tried to get young people to read them? Those were the days. Mag at the Comic Treadmill ponders the mystery Spidey ornament. John Jakala finds a Lost Girls review accompanied by an interesting photo. Ben 10 meets Captain Marvel, courtesy Chris Karath. Blockade Boy redesigns the costume of the Legion of Substitute Heroes' Night Girl, and it's fantastic. Collected Editions returns with a review of the new Nightwing trade paperback. Fortress Keeper praises some good Marvel books while disparaging DC. But...but doesn't he know all of us webloggers are supposed to hate Marvel? Johnny Bacardi laments the waste of a character. Brainfreeze wraps up her look at her funnybook weblogroll, which was nicely done. A brief description of each site, accompanied by a link to a specific post (tagged as "recent good stuff"). I enjoy it when people do things like this, and not just because sometimes folks say something nice about me. Well, okay, that's part of it, but it's also a good way to find new sites you might be missing. The only superhero Christmas image you need. I bet Dave is getting hotlinked up the wazoo because of this. 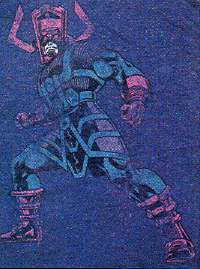 Yahoo "upgraded" their pinging service, so now the Comics Weblog Update-A-Tron 3000 has been broken. Dirk Deppey has the details. Dirk also pointed this out this new comic links aggregator, which comes to us courtesy Comic Book Resources. I spotted it in my referral logs a couple days ago, and the "comicne.ws" address looked so much like some of the referral spam sites that had been cropping up there lately, I almost blocked it. Good thing I checked first! So long to cartoon kingpin Joe Barbera. The man (along with William Hanna) gave us Tom & Jerry, for which we should all be thankful. "Shiny hands...make Hulk feel funny..."
And now, for no good reason I can adequately explain, here is every bit of the Hulk's dialogue from Marvel Team-Up #105 (May 1981), featuring the Hulk and Power Man & Iron Fist in "A Small Circle of Hate!" by Mike W. Barr, Carmine Infantino, and Mike Esposito. Enjoy, won't you? 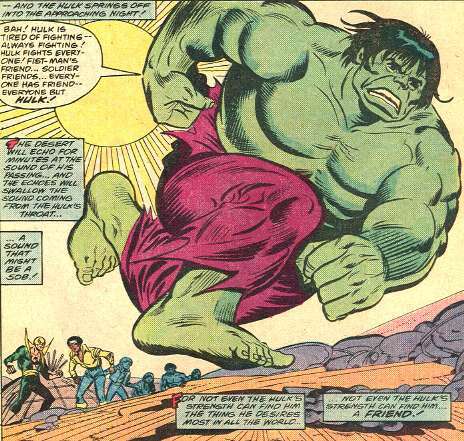 "Men in planes always chase Hulk -- never leave Hulk alone -- Hulk will show them! Hulk will make them leave him alone -- by smashing plane, so they can't find Hulk!" "Huh? Hulk thought plane carried soldiers -- but plane carries Fist-man!" "Huh? Fist-man tries to walk on Hulk?" "You hit Hulk -- now Hulk will hit you!" "Man thinks he hurts Hulk? Hulk is here now -- and Hulk will hurt him!" "Hulk will smash you all!" "Hulk is strongest one there is!" "They want Hulk to chase them! Hulk is smarter than that! Hulk will take this rock -- and make him come to Hulk!" "First -- man tries to jump on Hulk -- Hulk will hit rock out from under you!" "Leave Hulk alone! Hulk only wants to hurt man...but if you Hulk hurt you -- he will!" "Leave Hulk alone...or he will bury you!" "You hit Hulk! Now Hulk will smash you!" "Water?! You tricked Hulk -- you make Hulk look dumb! Now Hulk will kill you!" "Now Hulk remembers! Man tried to hurt Hulk! Hulk will get him for that!" "Soldiers! Soldiers come for Hulk!" "Man hits little girl?! Hulk will smash man!" "Yes -- now Hulk will --"
"Soldiers! Hulk forgot about them!" And there, just under the Hulk's eyes...is that off-register coloring, or is it...the tears of the Hulk? Pal Dorian has already covered message board reaction to that article, so I guess I'm stuck having to give my own opinion, gosh darn it. It would be funny if Jughead, after the redesign, looked exactly the same as he always had, in the classic style. Well, I'd find it funny. The real question is if Archie's fans will accept this new portrayal of the characters. There's a lot of resistance evident in that message board thread, but, as Dorian noted, it's mostly from folks who don't read Archie anyway, so those opinions can be discounted. The important opinions are from the folks who actually read the books...and I imagine they'll make their voices heard once the redesign starts its slow rollout. But whether those voices will be raised in protest or approval, I'm not certain. Honestly, I think it can go either way. Yeah, I'm waffling, sorry. If pressed, I'd say there's enough of a turnover in readership that the kids who don't like the new style will drop the books (which they'd probably do soon enough, anyway, as they outgrew them), and be replaced by new kids who only know Archie in this style. And this new less-cartoony style might possibly keep some of the readers around a little longer, as it may appear less like a "kid's book" and more like a contemporary teen romance/comedy on par with some of the manga books they might be reading as well. Of course, as that Newsarama article mentions, it's "experimental," and Archie may pull back from the new designs right away if they feel it's not going over well. Plus, there's the merchandising factor, where licensees may not want to shell out for Archie characters that don't look like how they've always looked...assuming Archie just doesn't stick with the familiar classic designs for merchandising purposes, regardless of whatever is going on in print. I don't know...that's all just off the cuff, there, so I may be totally off base. Let me know what you think, internet pals. What I am certain of, however, is that I'll be hearing a lot of this from parents at the shop: "Oh, look, they're still publishing Archie books...hey, this doesn't look like the Archie I remember!" 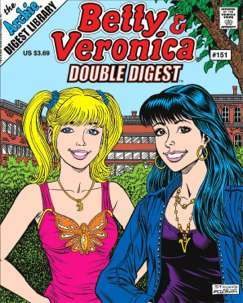 By the way, in regards to the Betty vs. Veronica debate from my site last week: it's all about Betty, baby. I sure post about Archie Comics a lot. EDIT: I like Beaucoupkevin's theory. I'm getting a lot of Spanish and Italian comment spam on my site, lately, mostly on year-old posts...so if you come across 'em, don't worry, I'll delete 'em right quick. And for God's sake, don't click on their links! Italians and Spaniards, working together to invade my site. Only one thing to do...UNLEASH THE GIANT SUSAN ANTON!